There is a permanent demand for computer systems, which are more powerful and smaller in size than the previous generation. At the same time the available components and interfaces shall meet customers requests. This results in ever smaller embedded systems. When a new processor and chipset with more power and functions is available, the complete system must be designed again. A solution is to use Computer On Modules, or "COM" for short. The basic idea is to place processor, chipset and memory on a dedicated board, but the peripherals for the application on another PCB, usually named a Carrier Board. When new processors are available, only the processor module requires a redesign. Such CPU modules have a defined form factor as well as specific connectors to a carrier board. The connectors provide a rich set of interfaces. It is the carrier board which makes the design task flexible. The implementer decides which connectors and interfaces are available or omitted on the carrier board. There are various standards with different sizes and options, ranging from PC104 (based on ISA bus) to COM Express (implementing PCIe). Vision Systems added Qseven™ products to its range of Industrial PC systems. Qseven is a new standard, which is defined for very small modules (70×70mm²) and also low power consumption. The standard is targeted for the ultra-mobile generation of 45nm technology. Since these new processors and chipsets are designed legacy-free, the Qseven standard is legacy-free also. Qseven provides PCI Express, PEG and SDIO, Serial ATA, Ethernet and USB. The standard limits the power consumption to 12 Watt only, which emphasizes the intended targets as mobile devices. Besides the targets of the specifications, Qseven systems are quite fine where small size and low power consumptions is an important design goal. Today Qseven modules are usually equipped with a NANO processor from VIA Technologies or an Intel Atom CPU. Both come with a suitable chipset, which integrates most if not all of the required functions. In terms of sheer computational power a Nano processor outperforms a current Atom CPU running with comparable clock frequency. The Intel Atom may require less power per operation, however also the chipset needs some power as well. Common chipsets for Atom need much more power than the processor, so currently there is no advantage in using an Atom. This will change. 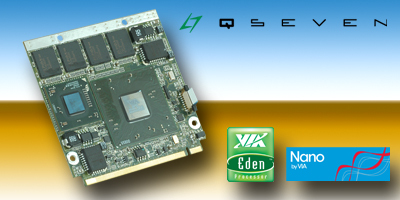 The Qseven modules provided by Vision Systems are equipped with the 64bit VIA Nano processor to operate modern software. On board memory is up to 1 GB DDR2 SDRAM. Modules based on an Intel Atom processor are under development. As a very power-saving alternative the processor may be a VIA Eden (Esther) operating at 500 MHz. For evaluation purposes a carrier board in ITX form factor is available also. To really get the advantages of Qseven based systems, a carrier board needs to be tailored to the requirements of the target application. Developers have to implement the interfaces and functional components. At the same time they omit components usually available in a Standard PC, but of no use in the target system. Vision Systems assists designers in two different ways. • First we offer sample schematics for often used components. This means functions like Super-I/O for Legacy interfaces as PS/2 (Keyboard/Mouse), serial ports or printer. 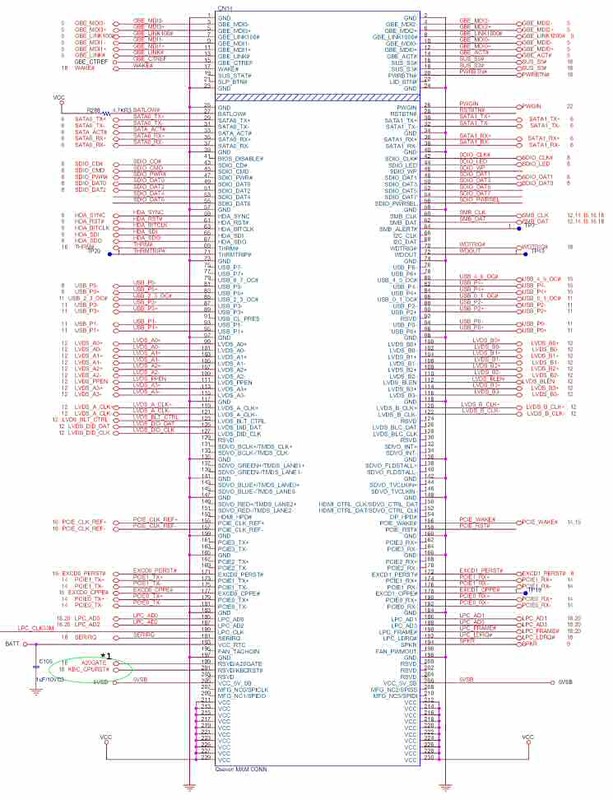 Customers do not need to develop the schematics for such components on their own. Instead Vision Systems has already prepared the files. Also Audio, LAN, USB and many more schematics are available. For a rough overview these files are provided in PDF, but OrCAD format is available for developers. Using these information customers will have a jump start to design their application specific carrier board for the Q7 core module. On inquiry customers will get access to these data. They may be sent by Email, or will be available for download via FTP later. • Second we offer the design of OEM / ODM carrier boards. With decades of experience in designing industrial computer systems for customers special requirements Vision Systems is prepared for a fast forward from idea to design. Given the specifications of the application we'll make an offer for the development of a system with just the required components. Customers preferences for certain components are respected; sometimes the application performs best with blocks based on selected models of interface circuits. Vision Systems is familiar with many interfaces, and can include these in the designs. Even the old-fashioned ISA-bus is not "dead", Q7 based systems can revive the old slots with new technology.